Thanks to Sam’s generous donation last week, I did not have to choose between gasoline and cheese, so we had quite the spread for SCT this week! Starting on the left, we have Président Brie in log form. This is a wonderful way to present the cheese since every slice gets the full range of flavors and you don’t have to worry about someone coming and taking the tip of the wedge. As for the flavor, Président makes a very nice brie, with a small amount of tanginess and a very smooth texture. Next up is Sartori Sarvecchio Parmesan. Since it is made here in the USA, they can’t call it parmigiano, hence the parmesan moniker. That said, it is every bit as salty, nutty, and slightly sweet as the real deal. This is an awesome cheese. After that we have Saint Angel, a triple creme brie from France. This was the winner today. Good grief! It is so buttery, and it just melts away in your mouth…. Simply an incredible, delightful cheese. Lastly we have Castello’s Saga, a blue brie that is the best of two delicious worlds mashed up into one, single party in your mouth. The blue is definitely there, but the funk is not overpowering. 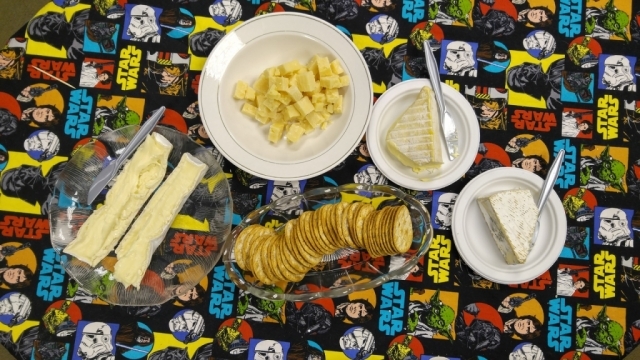 The brie is a tad “footy”, but again, not overpoweringly so. Combined with the smooth creaminess that the brie imparts, this is one of my favorites. Thanks again to Sam, and stay cheesy!